Release Date: January 15th, 2002. Sheet size: 23" x 33"
225 Limited Edition prints with SIX signatures: $175 30 Artist's Proofs with SIX signatures: $225 30 Remarqes with SIX signatures: $375 150 Group Edition with THIRTY FIVE signatures: $425 (Each Group Edition comes with a list of signatories, printed on prime, acid-free paper and suitable for framing). 50 Studio Edition signed by artist only: $95 140 Veterans Edition signed by artists only, not for sale. Spring of 1944. P-51 D's of the 361st. 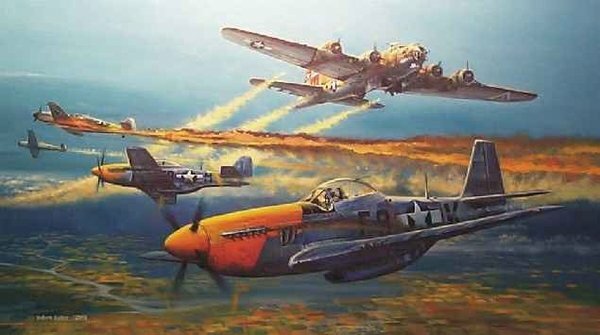 Fighter Group defend a crippled B-17 high over Germany. Principal signatories: Lt. Joe Kruzel; 1st. Lt. Bill Bay; Captain George Lichter; 1st. Lt. Robert 'Chuck' Wright; 1st. Lt. Henry B. Lederer; 1st. Lt. David Carl Landin.